In the 1980s, I photographed rock concerts both for my own pleasure and for Bristol's Venue magazine. In about 2012, I began the process of digitising the 1,000 or more black and white negatives I took. I’ve photographed The Smiths, The Clash, Elvis Costello, Nick Cave, Squeeze, Yazoo, Hugh Masekela, The Blue Aeroplanes, The Beat, Ian Dury & The Blockheads, The Undertones, Orange Juice, The Pretenders, Dexy’s Midnight Runners, Hanoi Rocks, Wreckless Eric, Talisman, John Cooper-Clarke, BB King, Martha Reeves, The Brilliant Corners, The Alarm, Frank Chickens, The Mad Professor & The Wild Bunch, Spear of Destiny, Yellowman, Tom Verlaine, Crazy Trains, The Christians, The Monochrome Set and very many others... I’ll Tweet when new pictures are put up, so you might want to follow me on Twitter. Most of them have never been seen before - I don't even know who a few of the artists are - but I've been happy to find that many of the images are better than I remembered. I was delighted to see one of my Smiths' images on the BBC's iWonder website. 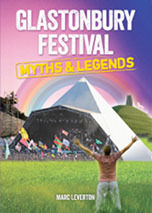 Great book called Glastonbury Festival Myths and Legends that features some of the Smiths' photos I took at Glastonbury 1984. It's by Marc Leverton who did some great books on Banksy too.